“It’s all about the Candy!”…. I have also used DCWV ‘Rockstar’ Stack, Sizzix banner die, Spellbinders square and star dies, and also Spectrum Noirs. < Previous ‘Born to be Fabulous’…. Karen, I’ve been wanting to tell you how absolutely darling this is ever since I first saw it in the library! Every time I see this little guys it makes me smile! Your card is so fun! I love the colors and the balloons are awesome!! Great job with the sketch! FUN Halloween card, Karen. The DP with the stars fits perfectly and your coloring looks great ! Great card, Karen! Love the colors of your balloons in particular! This is so cute! I love the starry night paper…it’s perfect!! Such a fun card! It just makes me smile! Love the image. 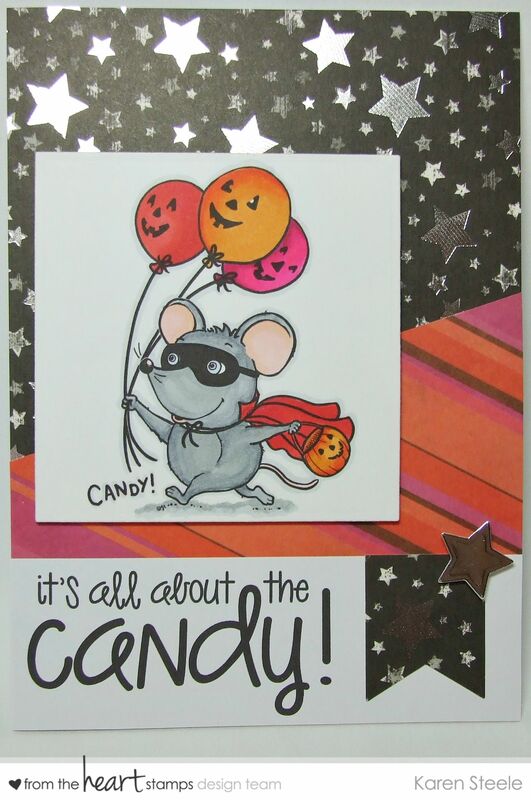 Very cute Halloween card…love it!